A six-year-old girl has been killed by a tiger at a zoo in Kunming in south-western China's Yunnan province. The girl was posing for photographs with the tiger when it was startled by camera flashes and pulled the girl's head into its mouth, state media said. 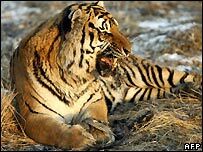 Staff beat the tiger until it released the girl, but she had suffered a crushed skull and died in hospital. The zoo has stopped allowing visitors to pose with its tigers for a charge of $2 (£1), Xinhua news agency said. The girl was identified as Rui Xin. Her mother was bitten on the arm while trying to rescue her. A local newspaper said the zoo had been charging visitors for the opportunity to pose with the tiger since May 2005.